Alter(n) in Literatur und Kultur der Gegenwart. Ed. Rudolf Freiburg and Dirk Kretzschmar. This volume contains ten German-language essays originally delivered in the course of an interdisciplinary lecture series on Old Age and Ageing in Contemporary Literature and Culture. This series took place in 2011 at the University of Erlangen-Nuremberg, where all but one of the contributors are employed. 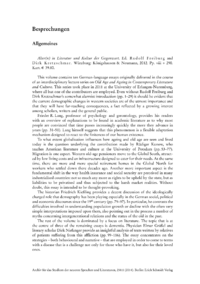 Even without Rudolf Freiburg and Dirk Kretzschmars somewhat alarmist introduction (pp. 129) it should be evident that the current demographic changes in western societies are of the utmost importance and that they will have far-reaching consequences, a fact reflected by a growing interest among scholars, writers and the general public. Frieder R. Lang, professor of psychology and gerontology, provides his readers with an overview of explanations to be found in academic literature as to why most people are convinced that time passes increasingly quickly the more they advance in years (pp. 3151). Lang himself suggests that this phenomenon is a flexible adaptation mechanism designed to react to the finiteness of our human existence.